A Class of One's Own: The guilt, oh the guilt! The guilt, oh the guilt! Another day stuck in bed, waiting for the antibiotics to kick in. The worst is wanting to go into school so badly and waking up realising you're too sick, again. My brain thinks, "Arggggh! You failed your students by not turning up!" Plus the added guilt of knowing some classes will be cancelled. Rationally, I know this is an exaggeration, an unhealthy way of thinking. I need to look after myself before anyone else. Our school has a policy of not providing relief teachers for year 12 classes if the class is on first or last period. Year 12's should be motivated enough to do work by themselves, apparently. Even if this is the case, I think students should be given the opportunity to do catch up work in the usual classroom at the usual time. the reality is, even Year 12 students need some guidance an supervision with their work sometimes. Many policies are made without consulting teachers. This is just one example of why it's important to have policy makers who have an understanding of the policy environment rather than purely from an economic standpoint of saving money on relief teachers. 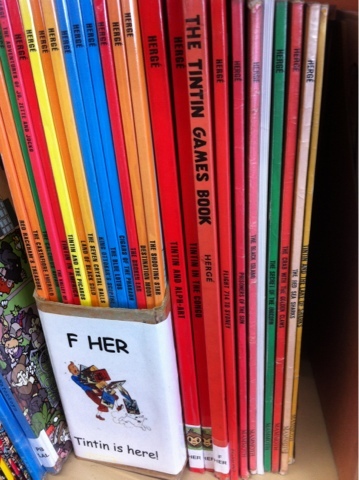 In happier news, my school library has the full collection of Tin Tin comics! I'm ridiculously excited to be re-reading them again. I'll always have a childhood crush on Herge's lovable, brave and valiant comic book hero.